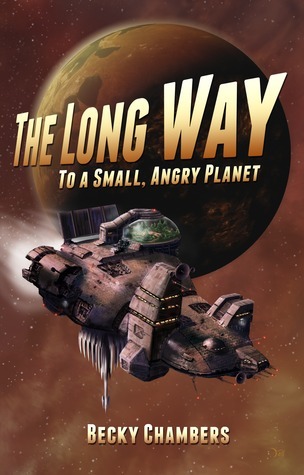 Originally a self-published novel and soon to be published as hardcover by Hodder in the UK, The Long Way to a Small, Angry Planet by Becky Chambers has earned acolytes, enthusiastic reviews and a Kitschies nomination. We had to check it out. Stand alone or series: Stand alone, possibly more to come? In a galaxy far, far away, in a future where Earth is no longer inhabitable and humans have only just been accepted as equal within the Galactic Commons of alien races, a small spaceship named Wayfarer traverses the vastness of space building wormholes, the roads that connect distant galaxies and systems. Crewed by a ragtag team, the Wayfarer has just accepted a new mission: to build a wormhole in a part of space where no road has ever been built before. The destination: a planet inhabited by an alien race that up until now had been hostile to the GC. Thus begins the Wayfarer’s journey to a small angry planet, via the long – long – way. The Long Way To A Small, Long Planet is a character-driven piece. Its plot is exactly as stated in its title, the chapters divided as in episodes, the viewpoints as many as its main characters, the Wayfarer’s main crew. Most of them, from captain to clerk, from doctor to pilot, from navigator to AI get a moment to shine, in vignettes-like sections that function as puzzle pieces that when put together form a whole that is both picturesque and charming. At first we are introduced to the Wayfarer and its crew by their new member, a woman named Rosemary, a clerk from Mars, someone On the Run and who has a Secret to Hide, hired to give the Wayfarer a semblance of authority and professionalism – the edge they needed in order to secure more stable work. That’s right: what the Wayfarer needs to be taken more seriously as a space road-builder is a clerk: not a fighter, or a security guard, or anything more dramatic. A competent clerk is all they need. This right there, tells you everything you need to know about how The Long Way To A Small, Long Planet works as a novel: each reader’s mileage will vary in terms of how they take the novel’s episodic nature, its slow pacing, the lackadaisical plotting, and above all, the incredible positivity when it comes to its characters’ arcs. To me, this is the space opera of my dreams in how it subverted all my expectations. Starting with Rosemary – who like I said, is a clerk. She does have a Big Secret and she might have lied about who she is, but she is at the end of the day, still a competent clerk and she saves the day multiple times by reading up on rules and history. Because she is clever. I expected Rosemary to hook up with someone aboard the Wayfarer and she does eventually. My money was in its captain but the love story that develops is between Rosemary and the alien Sissix and they have an interspecies relationship that comes along with charmingly awkward discussions about what they need and how to get what they need from one another. Sissix’s whole background story is fantastic by the way, with a whole bunch of observations about motherhood and polyamory relationships. On the topic of difficult romance, Jenks, one of the ships engineers is in love with Lovey, the AI that runs the ship and who reciprocates his love. Their romance is sweet and god, so hard to read, because there is a whole discussion about agency and whether AI are even WHO and not WHAT. On that same note, the ship’s captain is a guy named Ashy and he is just super…nice. He is not the dark, aloof type with a dark secret. Nope, he is a pacifist who won’t accept guns on his ship and he has a steady girlfriend. I have no idea when was the last time I read a SciFi novel without some sort of gunfight. Not that people don’t get hurt here or there isn’t drama. Quite the contrary, it is just that most of the drama is emotional and they are solved by people following the rules rather than breaking them. I have no idea when was the last time I read a SciFi novel where people didn’t break rules just to make a point. One of the crewmembers gets arrested and tortured and he must be rescued. What do they do? Do they mount a desperate excursion to rescue him? NO, they fill out forms – the biggest drama here is how Corbin relates to being arrested (heartbreaking, made me cry) and the fact the person who effectively rescues him does so because she knows it’s the right thing to do even when she does not like him. Am I making this book sound boring? It might be, but only if you don’t like people hugging out instead of yelling at each other to fix their problems. This does mean though that parts of the resolution and climax of the novel are a bit too pat. Primarily because there is a build up to meeting this new alien species and when we do, it’s confusing and unresolved and then there is a hearing and that’s that. But also because there is a thing – a big thing – that happens between two of the characters that involve consent issues about how to treat a disease (that folds back into a discussion on whether the person had a disease in the first place) that I do not think was resolved satisfactorily. With that said, in a perfect world, all books would give me the warm fuzzies the way The Long Way To A Small, Long Planet did. It is a delightful novel, full of witty repartee, nice people being nice to each other and developing warm and important relationships be them romantic or not. I can’t wait to read more from Becky Chambers. DISCLAIMER: This review is more of a regurgitation of my feels, and lighter on analysis. I thoroughly enjoyed The Road To A Small Angry Planet. An originally self-published debut novel (new edition coming soon from Hodder & Stoughton late this summer/early fall), this is a refreshingly different, slow-paced space opera that invests its time and energy in its diverse cast of characters. It’s probably the most… human (even though that’s probably a misnomer given the cast and scope of the book) science fiction story that I’ve read in… well, perhaps ever. 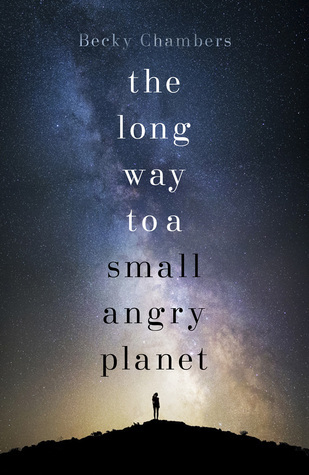 In trying to sort out my feelings for The Road To A Small Angry Planet, I felt initially at a loss at how to convey the feeling that this particular book gives you. I liked it very, very much – but when I try to analyze why, it’s not because of some intricate political histories, or revolutionary ideas on consciousness and identity, or cutting-edge hard astrophysics. There aren’t any nefarious machinations, or characters charging off on half-baked desperate schemes; there isn’t any unnecessary conflated, maudlin conflict over a Misunderstanding that could have been avoided with simple communication. This is not the type of book that I usually read. Hell, I’ll go out on a limb here and say, it’s not the kind of science fiction novel that most science fiction readers usually read. No, The Road To A Small, Angry Planet offers something different. Becky Chambers provides a unique and much-needed different voice in the canon of space opera – one that is largely non-violent, featuring responsible adults in a generally functional work environment, solving problems in a way that is reasoned and right. This book makes you feel like you’re on the road/at work with the crew of the Firefly-class ship Serenity (including some familiar character tropes in check), or, because I’ve been rewatching all of the episodes in Star Wars euphoria, the intrepid crew of Star Wars: Rebels. The book works because it’s a delightful, episodic, and entertaining team story about work colleagues and friends who are in it together, having a functional ensemble relationship and work environment as they make their long, slow way through space. Since Ana has hit on some of the major characters, I’ll profess my love for Dr. Chef (currently male Grum, who both cooks food and serves in medbay when needed); Kizzy (ship engineer, as exuberant and knowledgeable and personable as any ship’s engineer you’ll ever meet); and Jenks and Lovey. Like the microcosm of the Wayfarer, the expanded universe in this novel is richly detailed, diverse, and progressive. This is quiet science fiction, and thoughtful science fiction. It shows the best parts of people (and non-people) who live (mostly) in harmony with each other, and abide by a working, actual social contract in a functional society. It shows the positive side of political correctness and tolerance and diversity, in a way that doesn’t shove it down your throat or feel diadactic in any way. It showcases a faith in society, in humanity, in ALL people and sentient or self-aware creatures. It shows us that even if there are personality issues or disputes, or even imprisonment, not everything needs to be taken to the extreme of violence, war, or hatred. And that… well, that’s a pretty amazing feat to accomplish. Especially considering how jaded and hyperbolic so many SFF works (that I love!) happen to be. So in unpacking my feelings for The Long Road To A Small, Angry Planet, that’s ultimately why I very much liked this book, despite its slower, leisurely, episodic pacing. Like I said before: I thoroughly enjoyed this novel. I think you – anyone, everyone – will too. Science fiction can be progressive, entertaining, and enlightening – The Road to a Small Angry Planet is proof of that. So what are you waiting for? Get in a deepod and give it a whirl, won’t you? This sounds amazing! Character driven Space Opera reminiscent of Firefly – I’ll definitely be reading. Thanks for bringing it to my attention! The note that it was originally self-published brings up a worry for me (sparked initially by The Martian) – that I am missing out on so many great books because I don’t read a lot (any) of self-published work. The pool is just so large and overwhelming that I’ve kind of defaulted to the probably erroneous hope that if it’s a good enough book it will be picked up by a publisher. But is that really true? I’m curious what y’alls strategy is regarding this if you have one especially since you’ve been getting into publishing? This sounds awesome – I’ll be keeping an eye out for it.